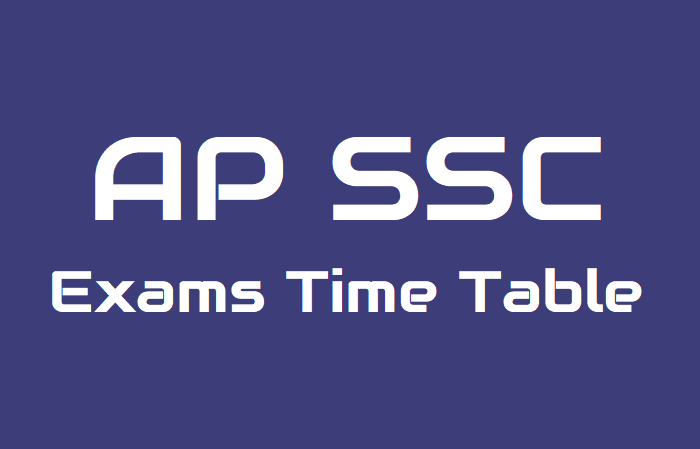 AP SSC March 2019 Time Table, Andhra Pradesh SSC 2019 Time Table, bseap ssc 2019 time tables, Directorate of Government Examinations, 10th SSC Public Exams March 2019 Time table schedule, SSC 10th Class Public Exams March 2019 Time table. Andhra Pradesh SSC Public Exams March 2019 Time TableSchedule details are provided here: The Board of Secondary Education, Andhra Pradesh state government is going to announce the Secondary School Certificate SSC Public examinations time table for the year 2019 in November to be conducted in the months of March 2019. The Board of Secondary Education has clearly indicated that the students of the entire Andhra Pradesh state may have follow the same methodology. The SSC public examination will be conducted in 2,850 centres across Andhra Pradesh from March 18, 2019. The exams, which will end on March 30, will begin at 9.30 am. Evaluation of the papers will be taken up on April 02, a day after the exams conclude, and the results will be announced in the first week of May. Compared to the 2018 academic year, 27,329 more students will appear for the exam this time. BSE Andhra Pradesh Class 10th Board Exam Time Table would be released by the Board of Secondary Education, Andhra Pradesh (BSEAP) on its official website. The board has notified that the annual examination for the SSC, OSSC and Vocational students will be conducted in the month of March 2019. Board of Secondary Education of Andhra Pradesh has released the date sheet for Class 10 examination to be conducted by the Board across the state. The examination will commence from March 18, 2019, to April 02, 2019. Students who will appear in the examination can check and download the AP Board SSC Exams 2019 date sheet through the official site of the Board at bseap.org. The exam date sheet is for academic, OSSC and vocational candidates (regular or private candidates). All the academic course subjects/ papers are common for both SSC academic course and OSSC course candidates. The candidature will be canceled if the candidate appears in the examination center other than originally allotted by the Board. Candidates can take a look at the official site of Board of Secondary Education of Andhra Pradesh to know more about the examination. For now, check the detailed date sheet for Class 10 exams. BSEAP SSC time table 2019: The datesheet for Secondary School Certificate (SSC) Examination 2019, for academic, OSSC, and vocational candidates, would be released at bse.ap.gov.in by the Board of Secondary Education, Andhra Pradesh (BSEAP). Both private and regular students, who will be appearing for the exams next year, can check out the entire schedule at the main website. The exams are scheduled to begin from March 18, 2019 and will continue till April 2, 2019. The Board of Secondary Education of Andhra Pradesh will be conducting the Class 10 examinations from March 18 to April 2, 2019, for the academic year 2018-19. The results of the exams will be announced before May 2, within one month of completion of examination. All the academic course subjects/papers are common for both SSC academic course and OSSC course candidates. The objective paper in the subjects in which they are given have to be answered in the last half-an-hour only except First language Telugu Paper -I & II/ Oriya Paper – I & II/ Kannada – Paper I & II, Tamil Paper I & II, Hindi – Paper I & II, Urdu – Paper I & II, Third language English Paper – I & II and OSSC Sanskrit Paper – I & II for which Part A and Part B should be given at the beginning of the examination and collected together at the close of the examination. 1. The Objective paper in the subjects in which they are given have to be answered in the last half-an-hour only. 3. SSC Public Examinations, March, 2019 will be conducted strictly as per the above time table even if the Government declares Public Holiday or General Holiday in respect of any date / dates mentioned above.